With the 2010 Northwest Folklife Festival just behind us, we’re already looking forward to 2011—our 40th anniversary! To celebrate this milestone, we’re beginning work on our next Cultural Focus: Northwest Stories, which will document and present the stories of people who live in the Pacific Northwest. And we need your help to bring this focus to life! Tell us what Folklife means to you. Do you have a favorite Festival memory? What was the first year you joined us at Seattle Center over Memorial Day Weekend? Did you meet someone special at Folklife? We’ll share these stories throughout the year and at the 2011 Northwest Folklife Festival, May 27-30. Share your memories! Post your story to our Facebook discussion page and read posts from other Folklife fans. Send us your story in an email! folklife@nwfolklife.org with the subject line “Northwest Stories.” We can incorporate your story into one of our blog posts. If you’d like to remain anonymous, we’ll honor that request. Videotape your story! Make a video of you telling your story (get creative!) and put it on YouTube. Send us the link and look for it, right here on our blog. Check back here as we post some of your Northwest Stories, and keep celebrating Folklife all year long! Long-time volunteer and Northwest Folklife Board Member Luther Black gives us some behind-the-scenes background on the folks responsible for the dance floor at the Roadhouse. Who is your community? What can audiences at the Festival expect to experience at your showcase? We call ourselves the FolkFloor Volunteers; we are Folklife volunteers/supporters who enjoy dancing in the Roadhouse every NWFL Festival weekend and throughout the year around our region. Every year anywhere from 70 to 130 volunteers work in shifts from Wednesday evening before to Tuesday evening after the Festival weekend. We assemble, tape, clean, wax and buff the 56′ X 96′ dance floor for four days of Roadhouse dancing. Then after the Festival we carefully take it apart, paint a portion of it, and return it to storage until the next year. Festival attendees are invited to come to the Roadhouse to see our large gray cushioned floor, and to join us dancing to the inspiring dance bands for contras, squares, swing, Cajun, blues, and more. 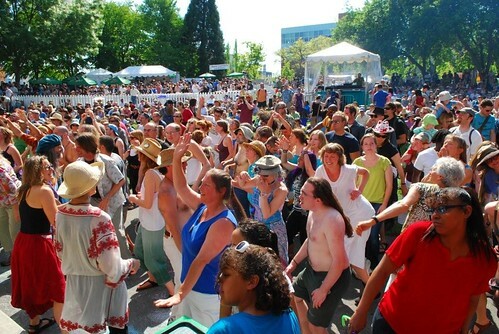 On Thursday (all day), or Monday night after 9 PM, all can join us as we assemble and strike, respectively, the FolkFloor at this year’s NW Folklife Festival. How long has your community been involved with Northwest Folklife? How did you first get involved? In 1987, an original core of concerned dancers and musicians raised the money, decided on a workable design, and installed the first FolkFloor in the old Flag Pavilion West, with the encouragement of the Executive Director and Production Director of the Festival. During the next three Festivals we made a few modifications to reduce wear and correct dust problems that arose. Since then, year after year, volunteers have returned to work on the FolkFloor, encouraging all to join in the community effort to make the Roadhouse an attractive, danceable venue. How are younger or newer folks getting involved? Each spring, as the FolkFloor volunteers start to discuss logistical plans for the Festival, we ask everyone to invite local dancers to join in the unique effort to produce a comfortable and quality dance experience at the Roadhouse. This spring we are reaching out through word of mouth and via social networking (e.g., Facebook) to get new faces involved with process of turning the Fisher Pavilion into the Roadhouse as we build out the Folkfloor. a. The FolkFloor came directly from the grassroots: its concept, design and execution were community-driven. b. Although several of the original volunteers no longer dance the entire weekend, they remain committed to the project and continue to devote hours of labor for the benefit of the entire community. c. Dancing of the sort seen on the FolkFloor is a living and growing tradition. We encourage current dancers and musicians to accept an active role in furthering the historic success of the FolkFloor. 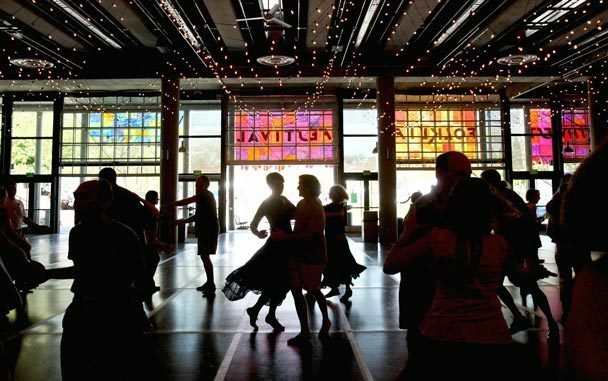 Community Coordinator Bríd Nowlan sheds some light on the Pacific Northwest Fiddle and Dance scene. Ours is a community of fiddlers, other musicians and dancers. The fiddle has been at the center of community gatherings in the Pacific Northwest since the earliest days of European exploration. Lewis and Clark brought with them no less than two fiddlers, who helped ease relations between the newcomers and the native residents. In 1862, at a wedding on the banks of the Duwamish River, fiddler Jake Lake entertained both European settlers and Native Americans with tunes still played here today. Fiddlers are still settling here, coming from all over the world with their tunes and dances. The Washington Old Time Fiddlers Association was founded in 1965 to foster the tradition of Northwest fiddle music. We have four community events at this year’s festival. The annual Fiddlers Showcase, Saturday 11AM-2PM at the Charlotte Martin Theatre, will feature some of the best fiddlers from the region and beyond. At 2PM Sunday, in the Roadhouse, you can dance to the music of three outstanding dance fiddlers from Washington State: Gil Kiesecker played fiddle for dances in the 1920s and 30s in Eastern Washington; Vivian Williams has been entertaining Seattlites for four decades; and Marty Dahlgren has been playing around the Northwest for the past seventy years or so. 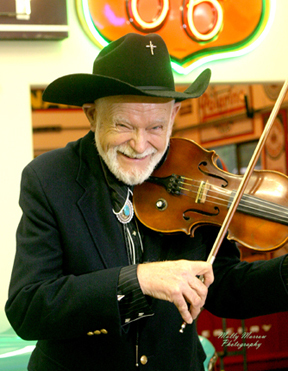 At a workshop, 11AM on Sunday morning, in the Lopez Room, fiddler and historian Linda Danielson of Oregon and Missouri fiddler John White will teach some fiddle tunes. At 4PM on Monday, we will present two hundred years of Northwest fiddling on the Narrative Stage, with fiddlers Stuart Williams, Vivian Williams, Warren Argo and friends. The Washington Old Time Fiddlers Association has been involved with Northwest Folklife since its beginning—the two organizations share Phil & Vivian Williams as founders. The Association had a stage with non-stop fiddle music in the first few years of the festival. Stuart Williams now organizes the Fiddlers Showcase, which has been one of the few places where Seattlites can hear older Washington fiddlers from outside the city. The Association has 16 districts across the state, each of which hosts regular jams and other events where new and younger musicians are always welcome. The Association’s annual workshop at Kittitas is an important source of instruction for new fiddlers. We also have several publications that chronicle the history and feature this music. 1. The traditional fiddle music of the Pacific Northwest tells the story of modern human migrations across the North American continent. European and French Canadian reels and jigs, Missouri hoedowns and Scandinavian walking tunes came here on the bows of numerous anonymous fiddlers to form the backbone of a unique musical style. 2. There has been a continuous tradition of fiddle music in the Pacific Northwest since the earliest days of European settlement. Before the mid-twentieth century fiddlers of all backgrounds played together here, generating a new sound of which just a few practitioners remain. By the mid-twentieth century, new recording technologies allowed musicians to maintain distinct threads of musical styles at a distance from their source. Wax discs, reel-to-reel and cassette tapes and now digital recordings allow people to learn their style of choice, whether Scandinavian, Irish or Appalachian, regardless of where they live. 3. Music is a community resource, an essential component of almost all our gatherings. It used to be dependent on a live musician and rooted in place. Over time new technologies encroached upon the musician’s place—and especially that of the traditional fiddler. More recently, the pendulum has begun to swing back again and there are probably more fiddlers now than ever before and more opportunities to hear music and participate in dances. The Washington Old Time Fiddlers Association honors the region’s tradition bearers while welcoming and encouraging newcomers. 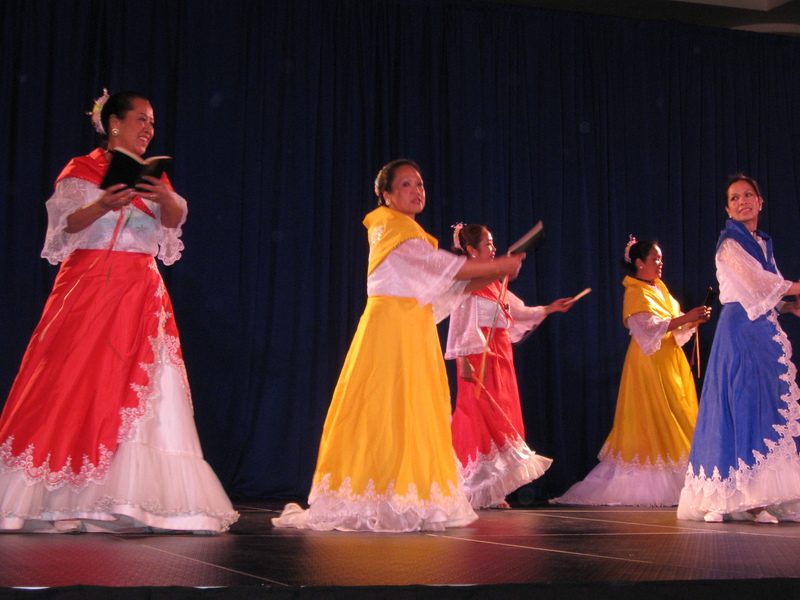 I have been involved with the Northwest Folklife Festival since the very beginning through the Filipiniana Dance Company. They have invited us to perform there almost every year. two young artists from the Philippines, and the speakers at the Narrative Stage are young and new in accordance with the subject matter. 1. Regarding our cultural traditions and art: It’s a mixture of Chinese, Arabic, Hindu- Malayan, Spanish, and American cultures because of our history with their contributions through conquests and assimilations. 2. Family is the most important to us and our Roman Catholic faith where we draw our strength and moral values. 3. Filipinos are a proud people and sensitive to human needs, hospitable, and very friendly. Community Coordinator Trisha Tubbs gives us the scoop on local bluegrass. The Bluegrass community is a diverse group of people who share the common bond of loving bluegrass music, love to play the music (at least 50% of bluegrass fans also play/jam), and love being a part of the Bluegrass community. Fans range in age from 3 years old to over 90 years. It’s not uncommon to see three or four generations of people having a great time jamming together. Although its roots are in the agricultural culture of the Southeast, the community is comprised of people from all walks of life. Loggers, college professors, carpenters, judges, teachers, students, retirees, ethnomusicologists, professional musicians (besides bluegrass, many fans are country, rock, pop, and jazz musicians….and even classical musicians such as Yo Yo Ma and Edgar Meyer), etc. A surprising number of bluegrass people are professors and/or are in the computer/software industry. Some of these people grew up with the music, while others came into it with the Folk boom or through friends or through TV programs or movie soundtracks (O Brother Where Art Thou, Bonnie and Clyde, Deliverance, etc.) Politically it has a double skew (both conservative and liberal). Demographic studies show that bluegrass fans are more educated than the norm, they tend to be more interested in gardening than normal. The community has strong values (community, faith, helping others, environment). The music also has a growing international fan base, particularly in Europe, Japan, and Australia. While not mainstream in the Black and Hispanic cultures, there has been a growing fan base in these cultures, too, mainly with those who love diverse music and acoustic stringed instruments. It appeals to people of all skill levels because it is easy for a beginner to pick up, yet expert musicians love it because its improvisational breaks provide a way for a musician to showcase his/her expertise. For vocalists, it provides a great outlet, too, often with thrilling three and four part harmonies. There’s a lot of variety in the music……Gospel, waltzes, hard-driving, heavy jazz influence, acoustic country, etc. What can audiences at the Festival expect to experience at your showcase? An exciting range of styles showcasing some of the top bands in the Northwest and the diversity of styles that they represent. We will be starting with some of the roots of bluegrass… folk/Appalachia/duets/harmonies starting with Cliff Perry and Laurel Bliss. Down the Road is a trio who will reflect the transition into bluegrass with a combination of Carter Family, old time acoustic country, folk and bluegrass songs. Northern Departure will showcase a combination of the youth in bluegrass movement (hot pickers!) and traditional bluegrass with some contemporary and pop influences. The last band, The Bluegrass Regulators, is the youngest band and shows the future of where bluegrass is going. These are award winning pickers with a very sophisticated sound…incredible musicians and singers. How long has your community been involved with Northwest Folklife? The bluegrass community has been involved with Northwest Folklife since its inception. Phil and Vivian Williams helped to found Northwest Folklife and the Seattle Folklore Society. They have been involved with the Seattle and Darrington bluegrass communities for many years, as well as with other music communities such as the Old Time Fiddlers and contra dancers. I first went to Northwest Folklife when we moved to the Seattle area in 1979. We took our instruments with us and met folks to jam with. My husband then played with several bands and started performing at Northwest Folklife. I’ve been a volunteer for so long I can’t remember how I started getting involved, but at some point thought there needed to be a bluegrass showcase concert since a number of other genres had special showcases at Northwest Folklife. Young people get involved in many different ways. Some of them are taken to festivals by their parents and grandparents, and join the jams. Some are in family bands and have been on stage since they could barely walk. 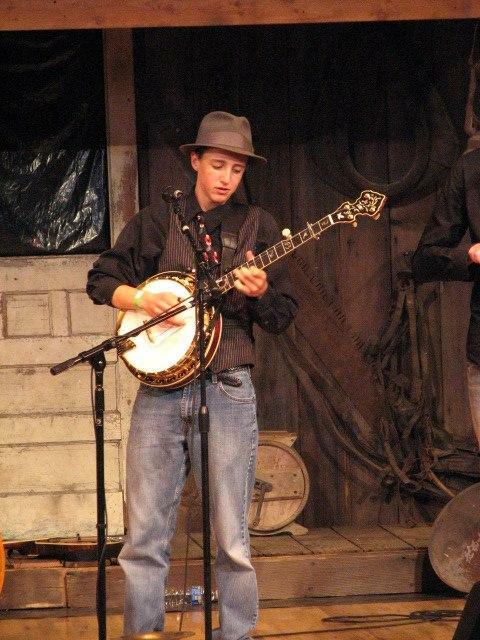 Many festivals have youth bluegrass workshops or camps. Many people get involved because their friends are involved, and they find a welcoming community. There are a lot of baby boomers who are getting involved in the music. These are people who have more free time now that their children are out of the house, and they find that they have the time to pick up an instrument. They find that it’s easy to get started in bluegrass music and that there are jams every week throughout the state, as well as private jamming parties. Many of the festivals have “slow jams” and beginner workshops, which helps them to meet other beginners. There are also a number of bluegrass camps that take place, some bluegrass courses at experimental colleges, and a couple of bluegrass courses at Shoreline Community College. 1. This is a great community that cherishes the tradition of its music while also appreciating innovation; it welcomes newcomers and encourages beginners, while it also embraces stellar musicianship (some of the top musicians in the world are bluegrass musicians); and it loves its music, especially singing and playing; musicians jam all night long when they get together. 2. Bluegrass is a uniquely American music named after a person, Bill Monroe. The roots of the music, though, come from Anglo/Celtic music, Southern gospel, African spirituals, African banjo, jazz, folk and pop. It is a roots/folk music that is most frequently learned by ear and/or are taught to others by pointing out the chords to be played based on the Nashville chord numbering convention. Communities of the Pacific Northwest are the backbone of the Northwest Folklife Festival. This year, we decided to focus on some of the communities that present showcases at the Festival. Many people have their favorite communities and genres at the Festival – we hope these posts will encourage you to try something new and see just how diverse our communities really are. A few times a week, we’ll bring you interviews, photos and videos of these communities, from Bluegrass to Hungarian and Filipino to International Folkdance and so much more.